If Hawaii presented a test for the Cal men’s swimming team in their first dual meet of the season Thursday, you might say the Bears passed not just with flying colors, but an entire rainbow of them. 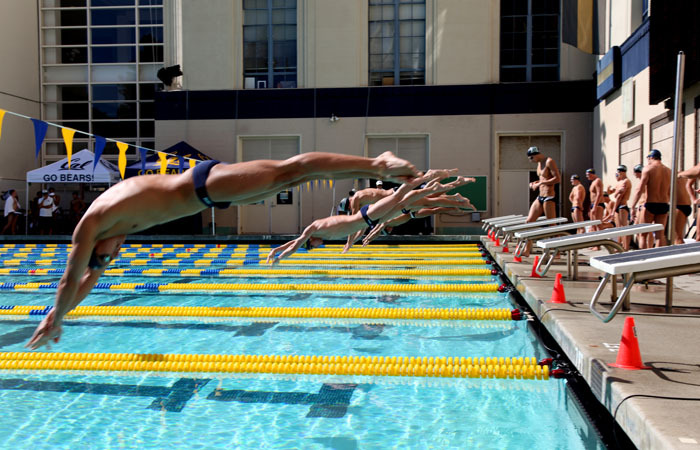 Cal swimmers — young and old, short-course and long-course —produced the fastest times in all fourteen of their events, an all-around performance so dominating the Bears forfeited the points from the final four events. The 154-135 win over the Rainbow Warriors (0-1) at Spieker Aquatics Center was not as close as the score would suggest. Still, according to coach David Durden, the meet could have been even better. The Bears (1-0) were also without junior All-American Tom Shields, who missed the meet due to personal reasons. But the rest of the team filled in admirably. Not only did Cal produce the fastest time in each event, they finished 1-2-3 in four of them and 1-2 in three more. No Hawaii swimmer came within half a second of winning an event — all the photo finishes were between Cal swimmers. One race with such a finish was the 500 freestyle, an event which senior Isaac Howell led from early on in the race. But in the final 50 meters, junior Ben Hinshaw charged back, edging out Howell by 0.04 seconds with a final time of 4:36.96. Perhaps the most thrilling race of the afternoon featured a freshman and a senior going head to head. Freshman Will Hamilton earned his first collegiate victory in the first individual race of his career. Hamilton held off senior Robbie Sullivan in the 200 butterfly by 0.05 seconds for a final time of 1:49.58. “It’s kind of a long race, and so I kind of decided to take it out easy and bring it back strong in the second half,” Hamilton said. Hamilton wasn’t the only freshman to turn in a strong performance Thursday. Tyler Messerschmidt, competing in just the second individual event of his career, held off fellow freshman Fabio Gimondi for the crown in the 100 freestyle, his time of 45.43 just a quarter of a second faster than Gimondi’s. Many of Cal’s experienced swimmers also turned in strong performances. Senior Nolan Koon won the 100 breaststroke by over two and a half seconds, his time of 54.81 remarkable given how early in the season it was recorded.